Never unlock the pintle hook with the dolly still under the rear trailer. The dolly tow bar may fly up, possibly causing injury and making it very difficult to re-couple. Apply converter gear spring brakes or chock wheels. Release pintle hook on first semitrailer. Slowly pull clear of dolly. When inspecting doubles and triples shut-off valves, which of the following is true? When checking that air is flowing to all trailers,what is used to provide air to the supply lines? Use the tractor parking brake and or chock the wheels to hold the vehicle. Wait for air pressure to reach normal, then push in the red �trailer air supply� knob. This will supply air to the emergency (supply) lines. Use the trailer handbrake to provide air to the service line. Which is true when checking air flow to all trailers? Go to the rear of the rig. Open the emergency line shut-off valve at the rear of the last trailer. You should hear air escaping, showing the entire system is charged. 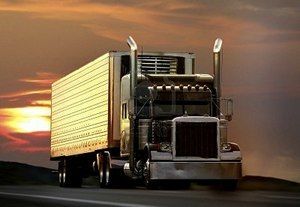 Charge the trailer air brake system, (i.e., build up normal air pressure and push the �air supply� knob in). Shut the engine off. Step on and off the brake pedal several times to reduce the air pressure in the tanks. The trailer air supply control (also called the tractor protection valve control) should pop out (or go from �normal� to �emergency� position) when the air pressure falls into the pressure range specified by the manufacturer (usually within the range of 20 to 45 psi). Charge the trailer air brake system and check that the trailer rolls freely. Then stop and pull out the trailer air supply control (also called tractor protection valve control or trailer emergency valve) or place it in the �emergency� position. Pull gently on the trailer with the tractor to check that the trailer emergency brakes are on. Check for normal air pressure, release the parking brakes, move the vehicle forward slowly, and apply trailer brakes with the hand control (trolley valve), if so equipped. You should feel the brakes come on. If the tractor protection valve does not work properly, an air hose or trailer brake leak could drain all the air from the tractor. This would cause the emergency brakes to come on, with possible loss of control.